It happens to everyone. You packed everything but the kitchen sink in preparation for your day of fun in the sun only to realise too late that you forgot to pack and apply the sun protection. Now you find yourself left with a sunburn and no choice but to wait out the pain and pray for a tan. However you may be surprised to learn that there are quite a few on the spot remedies that can numb that discomfort quickly and help speed up the healing process. Sunburns are literally the burning of your skin caused by exposure to UV (ultraviolet) radiation produced by the sun. Since your skin is burned you are going to experience pain and your skin is going to need to heal from the damage. However, with a few household items and a little know how you can get through the worst of it and try to minimise the extent of the damage. Could Relief be as Close as Your Refrigerator? On the spot remedies for sunburn call for some quick and easy to locate items. Luckily, some of the most effective items can be found right in your refrigerator or freezer. For some quick pain-numbing relief and to quickly cool the temperature of your damaged skin try wrapping a bag of frozen vegetables in a towel and applying it as a compress. Another way to relieve the pain, help soothe the skin, and reduce the inflammation is to prepare a milk or lettuce gauze compress and apply it to the injured skin. To use milk simply dip the gauze in room temperature milk and apply. With the lettuce remedy you will need to boil the lettuce first, strain the vitamin packed water, and then let the water cool to room temperature before you dip the gauze in and apply. For both sunburn remedies you need to leave the gauze in place for about 20 minutes at a time, and repeat every two to four hours until you feel relief. Since reducing the heat of your skin and relieving the inflammation that results from a burn is the best way to decrease the accompanying pain another great trick is to cut thin slices of raw fruits or vegetables and use them as compresses. 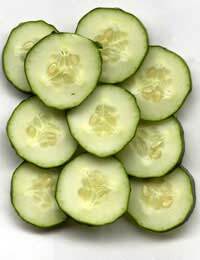 Chilled apples, cucumbers, watermelons, pumpkins, and potatoes make great sunburn relievers and they are extremely easy to come by. Just cool, slice, apply, and wait 20 to 30 minutes. If needed, reapply twice each hour. If you feel funny about wasting perfectly good food on your quest for sunburn relief, you can also scout out your dry goods for effective remedies. Kitchen staples like vinegar, oatmeal, black tea, cornstarch, and baking soda all make great on the spot remedies for sunburn. To get the most relief from a vinegar sunburn treatment you will need to add about one cup of vinegar to a cool bath and soak your entire body in it for at least 20 minutes. The mixture will help draw out some of the heat trapped in your skin and will also soothe the tightness and relieve the pain associated with sunburn. If the idea of smelling like vinegar has you uneasy but you love the idea of a long soak try preparing a cool bath with ¼ cup of cornstarch and ¼ cup of baking soda. These two kitchen necessities will work to soothe the pain away and relieve some of the inflammation. Other great bath time sunburn remedy additions include tomato juice, buttermilk, parsley juice, and lavender essential oil. Oatmeal doesn't just have to be for breakfast, it also makes a very soothing sunburn remedy and it's super simple to use. Just wrap some dry, regular oatmeal in a towel or cheesecloth, wet the entire bundle in cool tap water, and apply like a compress to your skin. After two or three 20-minute treatments your skin should feel less taut, cooler, and less painful from the burn. To turn ordinary black tea into an effective sunburn soother simply steep 4 to 6 bags of tea in one quart of water for 20 minutes. Let the tea cool and then dip in some towels or gauze and apply the solution directly to your skin. The antioxidants in the tea will help soothe skin inflammation and the cool temperature will help draw out some extra heat. If using your kitchen basics to reduce your pain seems a little to adventurous for you there are some simple solutions that can be found at your local store that make great sunburn remedies. Of course, you can always apply the tried and true and stick with a commercial solution of Aloe Vera gel, but some people do not find adequate relief with these products. If you are among them then you should purchase some vitamin capsules and have them on hand. These capsules can be used two ways to deliver sunburn relief. First, take the recommended dose orally. Vitamin E is great at working from the inside out to take the edge off of sunburn pain, and it works wonders on reducing inflammation. Second, you can break open the capsule and apply the vitamin E directly to your sunburned skin. The liquid works quickly to relive sunburn soreness and the nutrients in the solution help heal the skin and reduce the appearance of wrinkles and other sun damage. Two other commercial products that can bring great relief include regular pain relievers, like aspirin and acetaminophen, and vitamin C. Follow the dosage recommendations on the bottles and take the maximum allowed of both to ease the pain and start the healing process while you wait for time to do the rest. Getting burnt is never fun, but with a little advance planning and the use of some common items you won't be left to suffer next time you forget to grab the sunscreen.